Seems that the moderators of the Celtic fans forum (www.thehuddleboard.com) are proud and happy for the supporters of their football team to continue with the sick tirades from the evil and twisted fans on their website against the Scottish & British soldiers who gave their life to protect them. 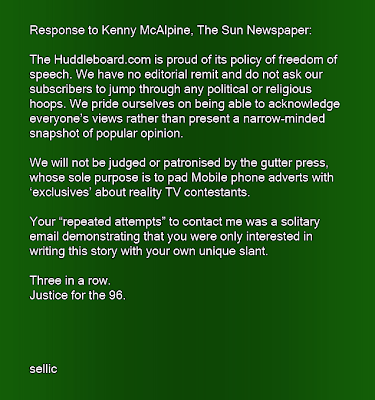 Below is an what was posted in response to the article in today's Scottish Sun. To add insult they have added "Justice for the 96" at the bottom if reference to the 96 Liverpool fans who tragically lost their lives at the Hillsborough disaster. Many Liverpudlians have also lost their lives protecting their country, a sad fact that seems lost on the poorly educated Celtic support on the Huddle Board.